MAGICK RIVER: Why would The Vatican threaten legal action against this ad? 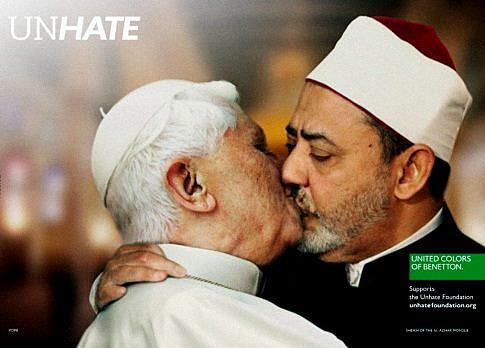 Why would The Vatican threaten legal action against this ad? Isn't it a sweet image? After nearly 15 centuries of animosity between Christians and Muslims - and between Muslims and Jews - wouldn't it be loverly if they would just kiss and make up? United Colors of Benetton is a fashion house, I know, but you have to salute their pluck when it comes to attention-grabbing advertising. As long as they have been in business, they appear to have promoted peace, unity and harmony on this planet - if only to sell more fancy gear, perhaps, but what's the harm in that, ultimately? Anyway, it's most unfortunate that UCB have been forced to take down the above ad from billboards and omit it from their magazine campaign. It says a lot about the cynical old men who run The Vatican. Firstly, they have no sense of humor; secondly, they don't really want peace, unity and harmony on earth; thirdly, their homophobia is only a pretense. I mean, I'm mostly hetero - so if you put up a photoshopped picture of me kissing some bearded guy, I might feel a bit grossed out, but in the end I'd just have to laugh out loud. Why would I bother sueing anybody - unless I'm actually a closet gay, and the image cuts too close to the bone? buried under the rubble of their bombed houses. 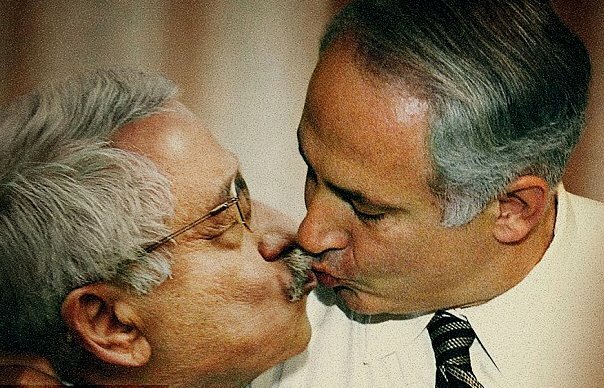 Wholeheartedly agree with your caption of Netanyahu and M Abbas kissing being 'definitely a lot more amusing than photos of wounded kids and people buried under the rubble of their bombed houses'! It does gross me out - as did the one with Pope-y on top, but I so agree with what you're saying here.